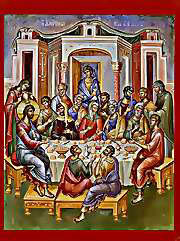 Starting in the year 325 at the first Ecumenical Synod at Nicaea, the articulation of the Christian doctrine and beliefs were detailed by a council consisting of representatives of all centers of the Christian faith. 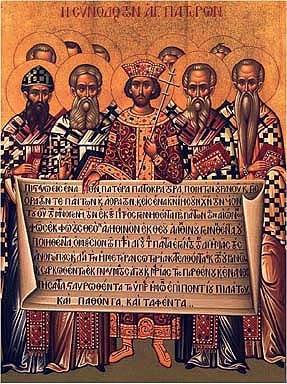 The Nicene / Constantinopolitan Creed was completed during the Second Council held at Constantinople in the year of 381. I believe in one God, the Father, the Almighty, Creator of heaven and earth, and of all things visible and invisible. An in one Lord, Jesus Christ, the only-begotten Son of God, begotten of the Father before all ages; Light of Light, true God of true God, begotten, not created, of one essence with the Father, through Whom all things were made; Who for us and for our salvation came down from the heaven and was incarnate of the Holy Spirit and the Virgin Mary, and became man; Crucified for us under Pontius Pilate, He suffered, and was buried; Rising on the third day according to the Scriptures, And ascending into the heavens, He is seated at the right hand of the Father; And coming again in glory to judge the living and the dead, His kingdom shall have no end; And in the Holy Spirit, the Lord, the Giver of Life, Who proceeds from the Father, Who together with the Father and the Son is worshipped and glorified, Who spoke through the prophets; In one, holy, catholic and apostolic Church; I acknowledge one baptism for the remission of sins; I expect the resurrection of the dead; And the life of the age to come. Amen. Some might ask, "Why do you have a Creed?" From the earliest times of the Christian Church, the question of adhering to the traditions of the Apostles and Christ Himself received the highest levels of attention. Paul wrote, "stand fast and hold the traditions which you were taught, whether by word or our epistle . . ." (2 Thess. 2:15). The Apostle Paul insisted that those issues delivered by him and the other Apostles, whether in writing or through a verbal passing of the traditions, should be adhered to carefully. He warned again " . . . in the name of our Lord Jesus Christ . . . withdraw from every brother who walks disorderly and not according to the tradition which he received from us" (2 Thess. 3:6). These doctrines taught by Christ and his appointed Apostles, must be held safe by "the Church of the living God, the pillar and ground of the truth" (1 Tim. 3:15) from any who might sway from the truth.